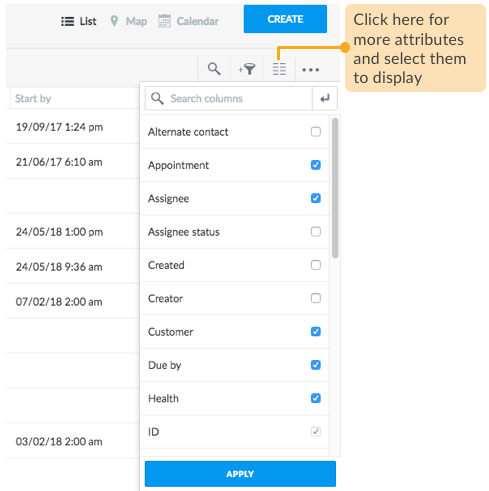 You can sort a flat list of Jobs, Assets, and Customers by their common attributes (such as by type, location, or updated date etc.) to obtain a display of records that are grouped on the basis of the values of the selected attribute. 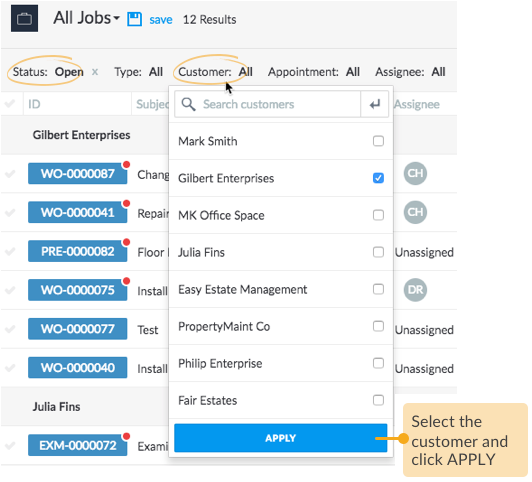 In the example below, the list of jobs are sorted by customers. When you want to fetch a narrow set of records (either Jobs, Assets, Customers, Workforce, Quotes and Invoices) on the basis of certain values, then use one or more combination of attribute filters that best match your query. 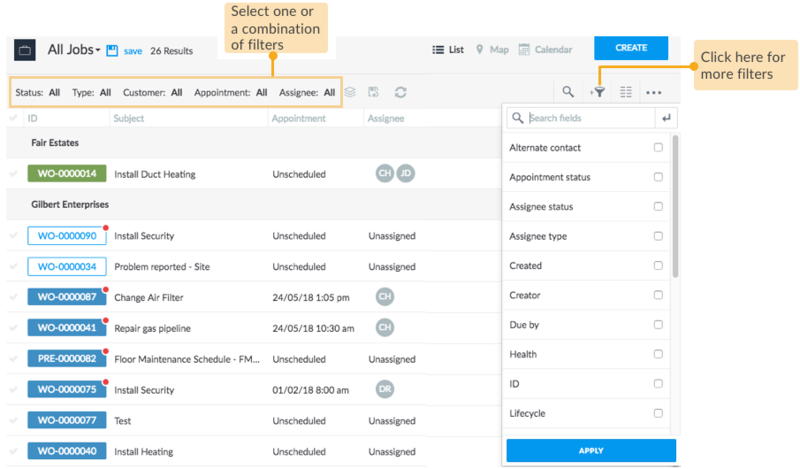 In the example below, the Status and Customer filters are applied to obtain all Open jobs for a specific customer. To search from a large pool of jobs, assets, customers, and workforce, all you need is the complete or partial value associated with the record you're after. the text that you enter matches the values available in Loc8. the text that you enter corresponds to an attribute that's already displayed on the relevant page i.e. of Jobs, Assets, Customers, and Workforce. If not, then you will have to add the attribute as discussed in the section 'Display your preferred attribute' above, and maybe save it as a quickview as discussed in the previous section. 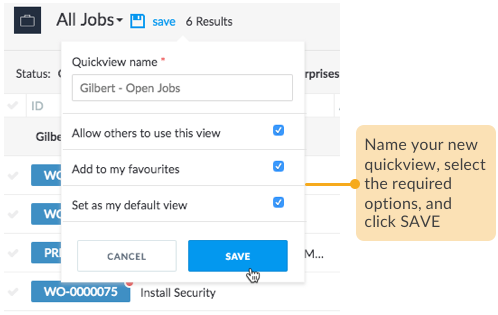 In the example below, a part of a customer contact's name is used to search the relevant jobs. 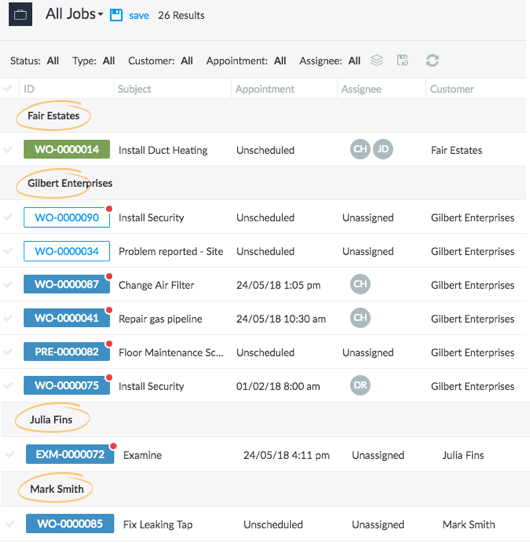 You have the flexibility of displaying your preferred attributes as columns on the jobs, assets, customers, workforce, quotes and invoices pages. This gives you the advantage of viewing records from a broader perspective and obtain a well-rounded information on all areas of your business. 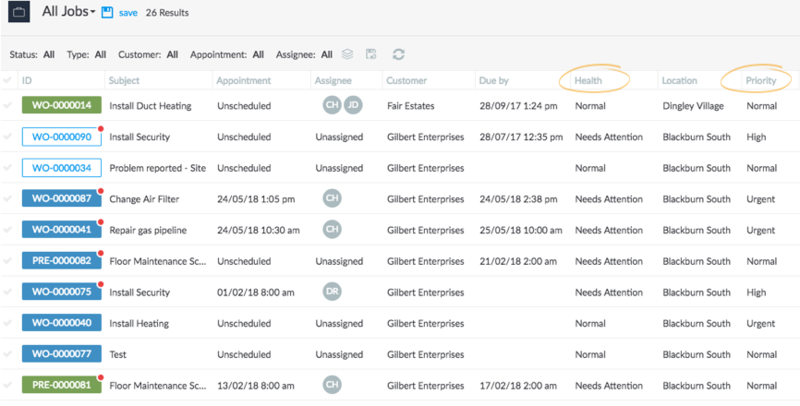 In the example below, the sample field service company monitors the Priority and Health attributes to quickly resolve emergency jobs. 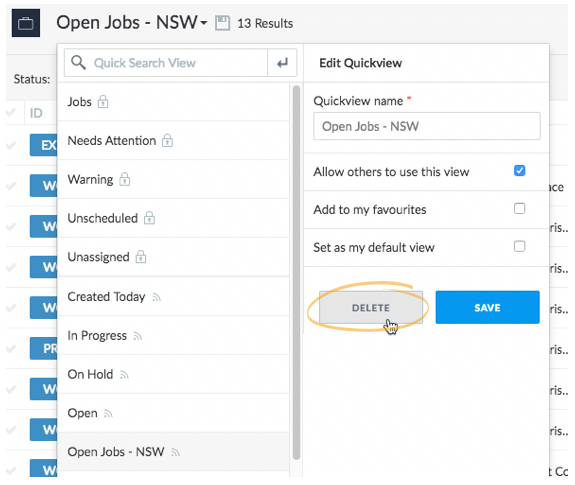 You can save your custom views as Quickviews, thereby eliminating the repetitive sorting and filtering every time you want to to retrieve a set of records. Make your quickview as the default view or add it to your favourites for easy access. 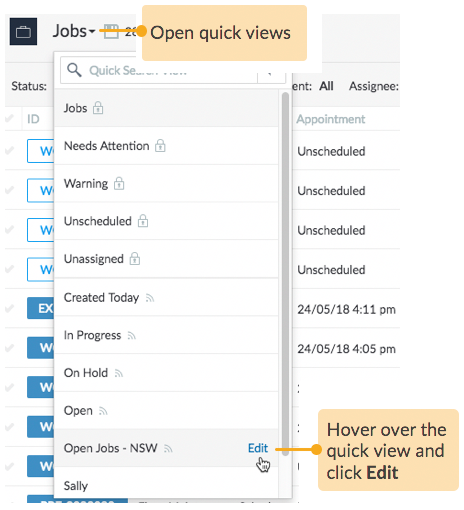 To ensure that you and your team are on the same page, you can make the quickviews available to anyone in your company. 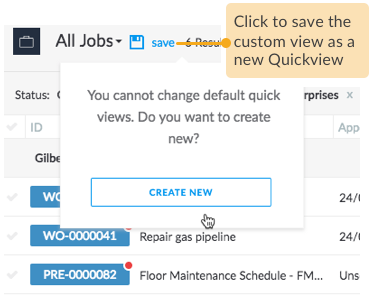 Each user can delete quick views created by them. If you do not see the DELETE option, the person who has created the view must log in and delete.